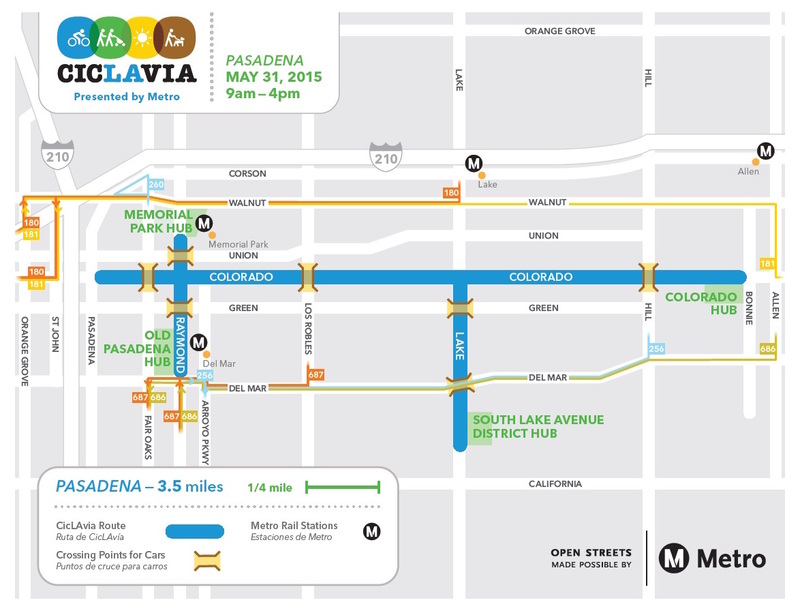 Pasadena will open its streets to CicLavia participants for the first time from 9 a.m. to 4 p.m. on Sunday, May 31. The route covers 3.5 miles, mostly along Colorado Boulevard, and it’s perfect for walkers, bikers and skaters to explore surrounding shops, parks and historical sites in the area. Those who wish to go car-free to the event can access the route via Metro buses or three Metro Gold Line Stations: Del Mar, Memorial Park and Lake Station. Plus, Go Metro and show your TAP card at the South Lake Avenue Hub for 15% off on CicLAvia T-shirts! On Sunday, Metro will run all Gold Line trains every 7 ½ minutes. Most trains will operate with three cars to accommodate extra bikes and people on board. If you’re traveling by bus, expect street closures to begin at 6 a.m. Sunday morning until 6 p.m. Sunday night along Colorado Blvd. between Orange Grove Blvd. and Allen Avenue. Some Metro buses will be impacted, including: Lines 180, 256, 260 and 687. See details on bus detours below. Buses and trains can get crowded fast during CicLAvia, so please follow proper bike etiquette! Here’s a friendly reminder on how to bring your bike on board without getting squished. Expect reduced bike rack availability on buses: If the bike rack is full, wait for the next bus or bike to the nearest Metro Rail station. Use entire platform length when boarding for more seating and bike space availability. Large groups should separate and enter through different doors to reduce crowding and delays. Please board with bikes using designated doors, as marked with yellow decals. Always walk your bike within Metro stations, on platforms or onboard trains. For everyone’s safety, do not bring bikes on escalators; use the stairs or elevators instead. Elevator priority should be given to customers with disabilities. Do not use emergency exit gates at turnstiles except during emergencies or unless directed by law enforcement or Metro personnel. Here are some Safe Bicycling Tips. Please visit CicLAvia’s website for more event information. Finally, those who prefer traveling to CicLAvia with a feeder ride or walk group can visit the CicLAvia website for details. L-San Rafael Ave., R-134 Fwy. East on ramp, exit Orange Grove Blvd. off ramp, L-Orange Grove Blvd., R-Walnut St., L-Lake Ave. and regular route. Westbound: Regular route to Lake Ave. and Villa St. then continue via Lake Ave. to R-Walnut St., L-St. John Ave., R-Colorado Blvd. and regular route. Eastbound: Regular route to Colorado Blvd. and Melrose Ave. then continue via Colorado Blvd. to L-San Rafael Ave., R-134 Fwy. East on ramp, exit Orange Grove Blvd. off ramp, L-Orange Grove Blvd., R-Walnut St., R-Allen Ave. L-Colorado Blvd. and regular route. Westbound: Regular route to Colorado Blvd. and Greenwood Ave. then continue via Colorado Blvd. to R-Allen Ave., L-Walnut St., L-St. John Ave., R-Colorado Blvd. and regular route. Northbound: Regular route to Raymond Ave. and California Blvd. then continue via Raymond Ave. to R-Del Mar Blvd., L-Hill Ave. and regular route. Southbound: Regular route to Hill Ave. and Walnut St. then continue via Hill St. to R-Del Mar Blvd., L-Arroyo Pkwy. and regular route. Northbound: Regular route Fair Oaks Ave. and Holly St. then continue via Fair Oaks Ave. to L-Walnut St., R-Corson St. to temporary layover zone midblock. Southbound: Depart layover via Corson St., R- Fair Oaks Ave. to Colorado Blvd. and regular route. Northbound: Regular route to Raymond Ave. and California Blvd. then continue via Raymond Ave. to R-Del Mar Blvd., L-Allen Ave. and regular route. Southbound: Regular route to Allen Ave. and Walnut St. then continue via Allen Ave. to R-Del Mar Blvd., L-Fair Oaks Ave. and regular route. Northbound: Regular route to Raymond Ave. and California Blvd. then continue via Raymond Ave. to R-Del Mar Blvd., L-Los Robles Ave. and regular route. Southbound: Regular route to Los Robles Ave. and Walnut St. then continue via Los Robles Ave. to R-Del Mar Blvd., L-Fair Oaks Ave. and regular route. The 780 doesn’t run on weekends. It’s a weekday only route. Wouldn’t it be nice if, as the funder of the region’s mass transit services, including those which are operated by other agencies, Metro could provide a unified source of all the detours by transit buses in an area, not just those it also operates? I wonder what will be happening to the Pasadean ARTS or the Foothill Transit buses that operate in this area. I guess I’ll have to visit those websites to see. Only in Los Angeles!